Cadwallon: City of Thieves is a fast-paced game of cunning thievery and ruthless skullduggery in a fantasy city steeped in magic and intrigue. Two to four players each control their own gang of four thieves, competing to amass the greatest haul of loot from the many carefully locked chests scattered about the board. This is no friendly competition, however, and there is little loyalty among thieves in Cadwallon! The most successful players are as likely to claim their loot from the other gangs as they are to do the time-consuming legwork themselves. And always there is the Guild, directing the gangs from the shadows, and offering rich rewards to those who follow its will. But there is little time to waste; even the slow-witted militiamen will eventually raise the alarm... and woe be upon any thief who fails to creep away before the lawmen seal the district! 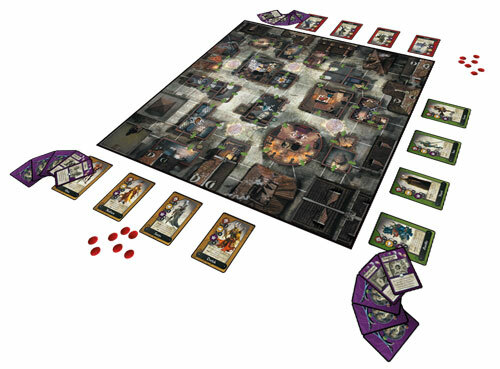 City of thieves is the game where action takes place in Cadwallon. Player take control of one guild of thieves and he tries to take so many golds and treasures from the city. Member of guilds cant attack other members from different guilds and take them treasure or coins if they won in battle. There are several scenarios in the game with different rules which can be choose at the beginning of the game. This game is fun, but has some issues, this is reason why this game didn’t make success on the market. Each scenario is different and this is really fun, but i feel that game is not complete. When we played this game in four players, turn for each player took to long and started to be a little boring. Confrontation was the game that probably had some of the best miniatures and artwork ever made. World that was created for that particular game was very interesting, so several other games – RPG, board games, card games and PC games as well – were made. “City of Thieves” is one of them. The basic concept of the game is simple – you control members of one of the gangs that operate in Cadwallon. Each member of the gang has different abilities and is represented by a very cool miniature. Every game is a bit different – because of the scenario that was chosen for that particular gaming session (players can choose from several different scenarios). The scenario specifies what is the object of the game, the victory conditions and some special rules as well. Of course, each scenario involves stealing stuff, finding treasure, fighting militia men and other gang members and some other cool stuff. Unfortunately, these scenarios present one of the main problems. They are not equally interesting, and some of them simply do not work (they sound cool, but game becomes tedious if you play them). Rules are also problematic – there are several fairly common situations that are not described in the rulebook at all. This can be very frustrating, especially during the first few games. The last problem actually lies with the stat cards – all characters have same stats, the only difference is the special ability. A bit more variety wouldn’t hurt. The main mechanic – with pool of action points that are spent for character actions – works great. Artwork is amazing – however, there are some issues on the game board (mostly regarding the walls and magical circles). I already mentioned that minis are very good – only complaint is that there are some parts that bend easily, so you have to be careful when it comes to storing them. The basic concept is fantastic – but the execution is not very good. The game feels rushed – and even game designers admitted that they have been pressed to meet the deadline, so there was very little playtesting involved. In it’s current form, it can be a fun game, but it can be also a boring one (depending on which scenario you choose and how many players are playing it). That’s bad, because it had a chance to be a truly great game. IMPORTANT NOTE: There is an expansion, that makes the basic game much better and definitely solves some of the mentioned problems. 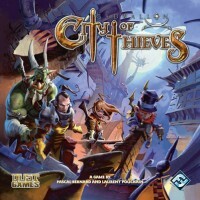 If possible, play “City of Thieves” with the expansion – it will be much more enjoyable. Add a Review for "Cadwallon: City of Thieves"